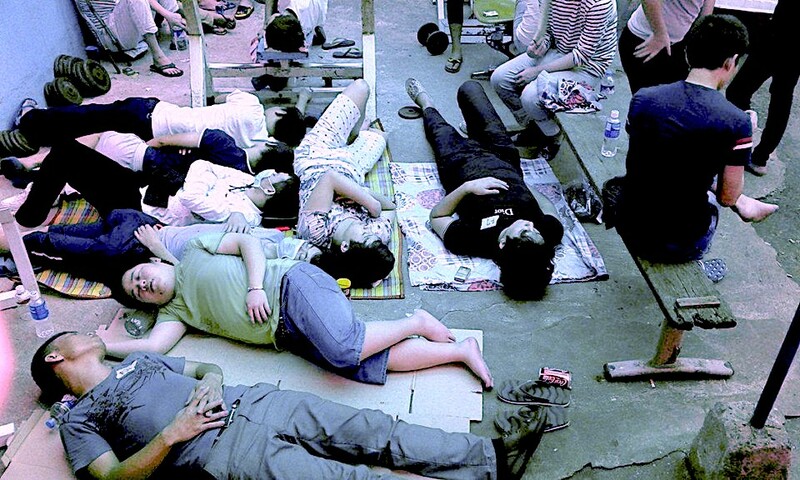 The crowded conditions inside the Bureau of Immigration’s Bicutan detention centre. Picture by former detainee Dave Bauer. Read his account by clicking on the link at the foot of the article. The Bureau of Immigration has vowed to toughen up the regime at its already infamous Bicutan detention centre for foreigners in Taguig City. BI Commissioner Jaime Morente today (Thursday, January 24) announced that detainees would be subject to more “shakedowns” to clamp down on contraband in Camp Bagong Diwa, also known as Bicutan. He made the remark after BI personnel seized mobile phones, sharp and pointed objects and other prohibited items during a raid earlier today. “Seeing dangerous weapons confiscated here prompts us to add stricter security measures,” he said in a statement. He also said there would be an investigation into how the prohibited items got into the detention centre. Other items confiscated during the raid included mobile phones and accessories, portable air conditioning units, portable Wi-Fi devices, knives, steel tubes, scissors, laptops, DVD players, decks of cards and cigarette lighters. “Past administrations used to be lenient in allowing the detainees to use gadgets, because the BIWF (Bureau of Immigration Warden Facility) is a detention facility for those to be deported, and not a jail,” he said. He added that today’s raid was conducted after he received intelligence reports on the proliferation of prohibited items inside the facility. The raid was conducted by the BI’s Intelligence Division and the Regional Special Operation Unit of the National Capital Region Police Office. The BIWF serves as the detention centre for “undesirable foreigners” who are undergoing deportation proceedings. It currently houses 236 foreigners awaiting deportation. In some cases, inmates can spend months or years locked up in the notoriously crowded and insanitary facility.